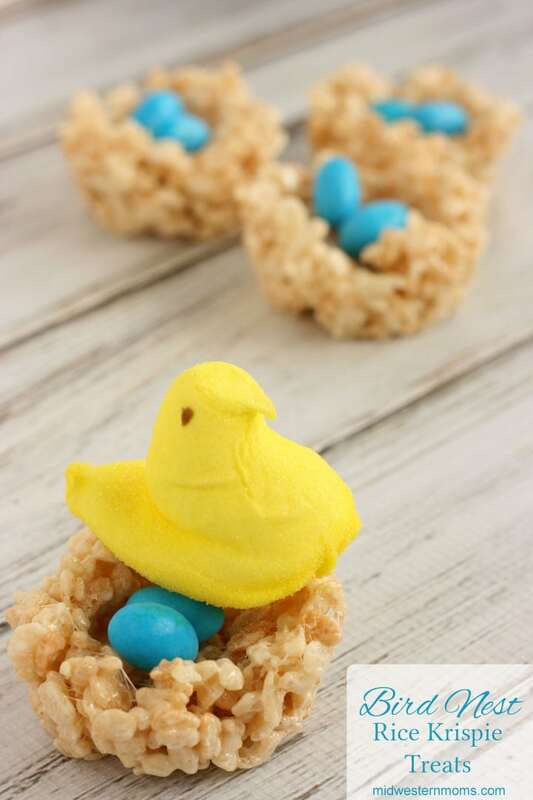 These little rice krispie nests are perfect for Spring Time and Easter. Simple to make and people of any age will enjoy them. Don’t worry, these treats look like they would be difficult but they really are not. After making your rice krispie treats (without putting them in a pan), you will need to work on forming the nests before the treats cool and harden. Grease the insides of the cupcake tin with a non-stick spray. Then spoon a bit of the rice krispie treats into the cupcake tin, and press down in the middle to create a nest. You do need to work fairly quickly so that the treats in the pan do not harden before you get to make them into bird nests. Once they have hardened, take the nests out and fill with some candy eggs and top with a Peep. Need tips for making your rice krispie treats? Delicious Rice Krispie Treats formed into nest-like shapes. Topped off with candies to make them look like a bird’s nest. Add Marshmallows – Stirring often so they don’t burn. Once melted, add the Rice Krispies. Stir until blended well. Spoon the mixture into greased cupcake tins. Press down the treats and use a greased spoon to make a dip in the nest. Once completed, add a few Robin Eggs candies to the nest and top with a Chick Peep. These are so fun! Perfect for spring and Easter! Those are so stinking cute! They turned out great! How cute and easy, love it! So super cute and yummy. Really creative! Happy St. Patrick’s Day to you! So cute and easy. 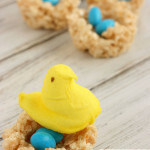 I am not a fan of cooking or hard recipes so this kind of Easter food snack that looks so cute is right up my alley!! I’m giving you a 5 star for ease, cuteness and Yumminess. Your Bird Nest Rice Krispie Treats are just adorable! Your post is awesome and thanks so much for sharing with Full Plate Thursday. These are so fun! We featured you at The Project Stash Link Party. Stop by, pick up your featured button, and share your latest creations! Happy Wednesday!